Hello. So I have a Alienware Laptop M15x, and recently I had it formatted and upgraded to Windows 10. However, for seem reason, Command Center can't seem to work. Nothing lights up, meaning the keyboard, the sound ports or anything, but from what it seems the touch pad above the keyboard works. I've looked throughout Google but have found no solution. I saw something about .NET Frameworks, but again no solution. 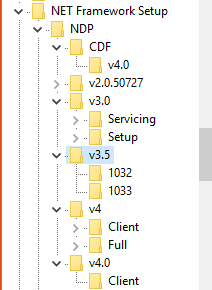 I have attached a picture of my .NET Frameworks, if someone can guide me step by step on how to exactly fix this problem it would be greatly appreciated. I have the exact same problem. Also there is an error with the .Net framework 3.5 it seems to interfere with the alienfx controls and having the controller in the hidden icons to adjust things. Also Windows 10 has disabled some things such as the fan. Conflicting programs and such. Dell hasn't even tested our laptops for windows 10 or updated the command center for us to download a compatible one. I am waiting to chat with tech support tomorrow when they open. If I find a fix I'll let you know. I contacted dell...who gave me the run around to speak to alienware tech support. I contacted them. They basically told me to *** it in nicer terms. That I have outdated hardware, it isn't supported, and to buy new hardware through a 3rd party. Basically....writing a little code to patch the command center is too much a bother and I should waste money on a new computer. Funny....this one works fine and runs all my games. Thank you for your recent contact. Your system hardware is no longer supported. We recommend checking out with a 3rd party reseller for parts and service for your system. If you need drivers and applications for your system visit our http://support.dell.com website where you can find the latest drivers for your system. Thank you for choosing Alienware.